A couple of weeks ago I was testing my little Heap layout, shunting a couple of wagons back and forth and found as I switched around watching my little engine bustle about the board, a part of me was just wanting to watch it go off trundling on its own...that coupled with a dodgy 009 point frog sealed the layouts fate...it's now sat in the garage awaiting a new point on order form a local store. I am also straightening out my 3x2 base board as it seems to have sadly warped in the garage leaning against the wall...oops! To pass the time, I have reached into my modelling fund and bought up a circle of 103mm radius Tomix track. With this I hope to build a small pizza layout, incorporating scenic features of my planned larger model, treating it as both a warm-up to the bigger long-term layout and to use it as a test track to play with my Gnine stock. Using Tomix track demonstrates it's own merits in previous threads, it's a really simple product to use, and the radius keeps the final layout size down, meaning I can work on it with ease in front of the TV in the evening, and store it up on a shelf when it's not being worked on. The base is layers of corrugated card from fruit boxes, they are surprisingly strong, although of course that is a good thing, I decided to build up some of the land using off-cuts etc, so that the layout had some dimension to it! All I intend to do now is scatter a bit of grass down...yup, just some greenery as I have not quite decided what I'd like to feature in the centre – I had built a workshop out of balsa...but it's too large for this...if anyone has a suggestion I'd love some inspiration please. Last edited by demaine22 on Mon Feb 18, 2013 10:46 am, edited 3 times in total. Good to see you have something running No turning back now. A small shed in the middle is always a good option. I like the shape of your base and think there is a lot you could do with it. As mentioned a small timber shed or shelter is always a good way to set the scale for the scene and nice for somewhere to add detail. I get the feeling you like derelict and run down, so for the centre, how about the remains of a collapsed building. Just one corner still standing but not full height, with all the rubble lying around it. Add in a few bits of rusty junk with weeds growing through it and it could make a nice little cameo. Thanks Steve, the Tomix track is so simple to work with, I don't blame you for planning another layout, it gets you straight into the scenic part with such little hassle. I fear I may not be able to pull off something like this...need a bit more practice I think. I would like to keep the building/mess/overgrowth quite central, as the outside edges look deceptively large in this picture. Would something like an A frame look out of place? I like the idea of the loco travelling under or through something, just not sure what. This is quickly placed together and nothing glued, just for a feel of how it might look. A bit more debris still required, an odd window frame or bit of corrugated lying around. Plus dirt weeds and stuff like that. Now why can't I keep things simple like that! I like this idea Steve, quite effective yet simple to execute, and would give a good excuse for wagons trundling around with scrap bits inside. The ideas I have had myself so far, is a pile of scrap bits / loco parts (dumping ground for the Heap) or maybe a small log store that is a little in need of a coat of paint...I'll have a sit tonight I think and look at what I can knock up. demaine22 wrote: Now why can't I keep things simple like that! Can see that you have come up with a couple of good ideas yourself, so this was probably not needed, but hopefully it will trigger something in someone else. It does make for a believable reason for a small gauge railway though. I'm sure you must have seen Ian Thompson's inspirational firewood train, but if not it's a joy to view. The scrap/salvage theme would work too and could offer up some nice weathering to play with. Okay, I need to ask, 1.) how did you make those bricks, and 2.) how do you make all those cool plants? I feel like I'm stuck in the modellers equivalent of the stone age compared to the people on this forum. kf4mat wrote: Okay, I need to ask, 1.) how did you make those bricks, and 2.) how do you make all those cool plants? Well the bricks were the easy part They were made of plaster poured into a rubber mould, 16 at a time, cleaned up then stained with dilute acrylic paint. A bit tedious, but doing small batches at a time isnt too bad. The plants are made of coloured paper and shaped using punches intended for decorating greetings cards. You can find a whole lot more about the process in an old thread which gives an almost step by step guide to the process. Pull up a comfy chair, pour a drink and start from HERE. I thought it looked like there were not enough bricks in the ruin, for it to have been a complete building. Steve, those are really great looking bricks. How did you achieve the V indent on the top? Thanks for the link back to Ian's log train it is wone of my all time favourite locos. michael wrote: Steve, those are really great looking bricks. How did you achieve the V indent on the top? 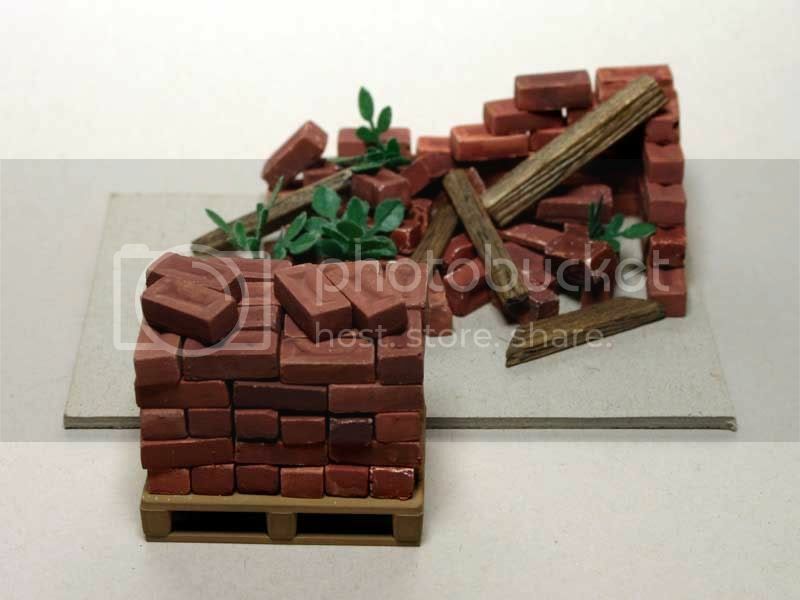 I cant take any credit for the bricks, I used a mould from JIGSTONES , though mine came from Back2Bay6 here in the UK. They are slightly overscale, but when used in isolation like this, it really doesnt show up. Thanks, I thought that you might have made your own mould. But why reinvent the "wheel" Brick as they say. I couldn't figure out how to do a strikeout. Don't worry Steve, hijack as you wish, I find the brick work interesting and I hope to try it in the future. I thought I'd update with a little bit of progress. My pizza has gotten dirty and gained some overgrowth. This is the base scenic work I now hope to build around, and give the layout some personality. I was not too pleased with my hanging basket liner grass, but otherwise I'm happy with everything else! Picked up some bits from Mr Bennett today, and I hope to update with something about that soon. demaine22 wrote: I was not too pleased with my hanging basket liner grass, but otherwise I'm happy with everything else! The great thing with a small layout like this though, is to use it as a test area for new techniques. If something doesnt work, you can always rip it off and try something else. They are ideal for that. Certainly looks good though Jon, worth the time taken! A small 'rushed' update – promise proper pics next time. The little wooden structure is the beginning of the centre piece...this will be a nice little log store at the bottom, with some tools stored on the upper part. The next part of the centre piece will be what I believe is called a charcoal retort, but I could be wrong. Simply put this is used to turn the logs to charcoal, this in turn, can be used in the garden to retain minerals and stabilise carbon in the soil...bit of a 'green friendly oomph' if you have a small holding. 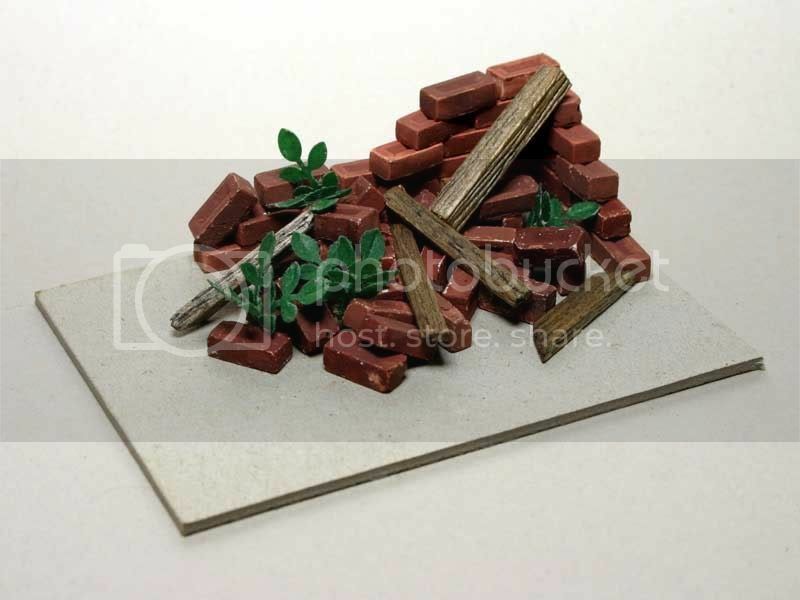 Once I have these built and painted I want to return my focus to the ground cover, and some surrounding detailing. Last edited by demaine22 on Mon Nov 07, 2011 1:39 pm, edited 1 time in total. Nice little centre piece there, I like your ideas for it. Regarding your ground cover, the scatter you've used would make a good base for further work. Maybe static grass of varying lengths and shades, hanging basket liner or countless other products available! Between working (yeah right) I've been experimenting with some cheap OO gauge tree armatures and various flocks to make bushes. My greenery is far from finished, but I'm in exalted company there! Thanks Sam, I think I'm going to strip some of the scatter back around the centre to achieve a more 'trodden' area, and as you suggest add some nice tufts of grass and over grown areas around that. I'm also looking at ideas for presenting the layout - more on that later though...must remember not to get too carried away! Even if your neglected tracks looks nice, maybe you could add a bit of sand around them, just enough to get a feeling there "once" was some .. Don't remove the grass between the tracks, it looks great, again, just a "touch of sand" , no more. Just my two cents. Great concept with the charcoal burner Simon. wish I had thought of that one, as it is an ideal subject for a small gauge like Gnine. Quite often, retort kilns for charcoal are little more than an old oil drum, so you shouldnt have too much trouble fitting one, or maybe even two. I would suggest that the next step would be to decide where to put the burners and any other items like log piles. Once you have that you can work out where the natural walkways would appear. Of course, the heat from the kilns would also kill off any plant growth in there immediate area, they pack a lot of heat. Have to agree. Found some links to simple home made kilns. Hope they help.